Comedian Rick Mercer recently recommended that Canadians, Torontonians in particular, embrace snow days. Snow days are days on which heavy snowfall dictates that Canadians stay home instead of going to school or work. Rather than defiantly traveling and risking accidents, or staying at home fretting about work getting behind or kids losing school time, Mercer counsels Canadians not only to accept what Nature and the O.P.P. decree, but to celebrate snow days. Isn’t that Un-Canadian? Canadians are cut from tough cloth: probably weatherproof, down-filled cloth, with an attached parka. Attitude often depends on geography. Or as a friend recently declared, while skillfully maneuvering her car through a blizzard so severe that the parking lot at Wal-Mart was almost deserted, “I’m from the B.C. Cariboo country. If we didn’t drive in snowy weather, we’d have to hibernate till spring!” Mind you, a lot of people with her gumption who did not share her driving abilities steered their vehicles, nose first, into snow banks, where they stuck. Both attitude and aptitude are essential. Work certainly continues on the farm. Try telling livestock they won’t be fed till the storm’s over. They need nourishment now. Dairy farmers still have to milk and get that milk to market. Few people have the luxury of taking a day or two just to enjoy winter. Especially in the Canadian North, a winter day is just another work day. So writes a fellow describing his preparations for travel to a construction site. “ Work carries on, no matter the temperature. 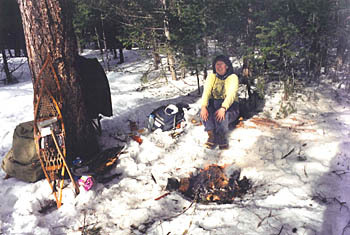 You carry survival gear with you, lots of clothing, sleeping bag, fire starter. “ Mind you, in this part of Canada people will barbeque till the propane gels at -32. Rugged folks. In most of Canada, no matter how cold and cruel the weather employers and teachers expect students and workers to show up, ready and eager, if a little frost bitten. When I was in grade school, walking the proverbial mile there and back, our family didn’t own a thermometer. Oh, sure, we could tell it was 40 below because, at that temperature, the sap in pine trees would freeze with a resounding crack. Otherwise, the temperature was anybody’s guess. Our parents expected us to chomp down our porridge, bundle up, take our lunches and march off to school. Several times my brothers and I arrived only to discover that it was so cold the wussy town kids, whose families had thermometers, wouldn’t go out so the school was closed. No problem. We walked home and skied for the rest of the day. Winter travel, then as now, presented problems. Trying to return home after a Xmas visit to my parents wasn’t a simple matter of packing up the presents and waving farewell. First we had to determine when the CNR train was expected from Jasper. The timetable meant little to a train chugging through prairie storms and mountain avalanches. We had no telephone so my brother and my husband started my Dad’s truck and set off for town to find out. There’s that mile journey again. Snow plows cleared small country roads last, and they hadn’t gotten to my parent’s. Halfway to town the guys got stuck. Out they got, shovels at the ready. Some hard shoveling enabled them to drive the truck a few yards forward before the truck was stuck in snow again. After several repetitions, they realized it was a losing battle, left the truck and struggled through the snow to the station where they were told the train was on time. “Oh, no, not on time!” Life in a logging community meant that a friend with a big truck wasn’t far away. A logging truck’s deep growl was the first hint that our transportation had arrived. My husband ran into the house yelling, “Get your coats on! Get the suitcases! Bill Holmin’s driving us to the train!” We clambered into the cab, hauling luggage after us, and made the station just as the train rounded the curve. It took a lot more shoveling to free Dad’s pick up, and, for a month afterward, my parents mailed us items we’d left behind. We never considered not going. People can be just as stubborn about getting out for recreation as they are about going to work. I had time to reflect on this a few years ago as I stood by the side of the highway, in a blizzard, waving a flashlight, hoping to warn off transport truckers who couldn’t see any farther than I could. Beside me, trying to put chains on his vehicle, was a man whom I’d tried to dissuade from going snowshoeing that morning. “There’s a severe blizzard warning. People are told to stay home.” He was one of those tough Canadians. No mere snowstorm could prevent him from enjoying his Saturday outing. When the blizzard hit us, he thought it was time to put the chains on, not an easy task in snow whipped by a fierce wind. He managed, no trucks ran us down, and we drove on. Ten minutes later even he admitted defeat, turned the vehicle, and headed for home. He hung his head for days, ashamed of having had to turn back. Not me. Home looked so good. Rick Mercer’s right. Enough of this dour Canadian sense of duty. We should just accept that sometimes, Nature bats last. Word from the north is that at temperatures of -45 to -50 rugged but really smart northerners try to stay home. If they can, so can we.